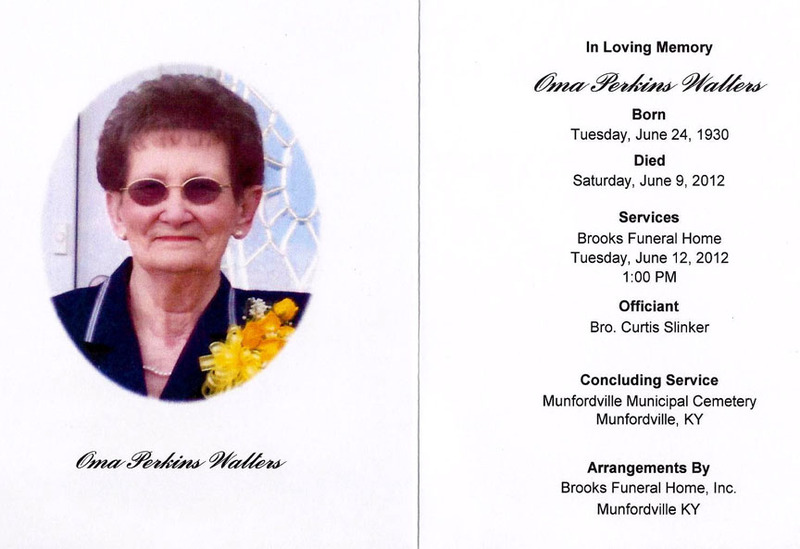 Oma Perkins Walters, age 81, of Munfordville, KY, passed away at 1:22 AM CT Saturday, June 9, 2012, at T. J. Samson Community Hospital in Glasgow, KY. The Hart County native was born June 24, 1930. She was a homemaker and a member of the Wilkerson Temple United Methodist Church. She was the daughter of the late Lewis Thad Perkins and the late Lillie Florence (Reynolds) Perkins. She was the wife of the late Carl Walters. She is survived by One Daughter: Sharon Dennison, Horse Cave, KY; One Granddaughter: Allison McCutchen (Ken), Bowling Green, KY; One Grandson: Adam Dennison (Amanda), Horse Cave, KY, One Great-Granddaughter: Whitley Rose Dennison, Horse Cave, KY; One Step-Great-Granddaughter: Christa Lynn Carroll, Horse Cave, KY; Two Sisters: Nellie Self, Munfordville, KY; Ruth Snodgrass, Louisville, KY; Two Brothers: Leslie Perkins, Indianapolis, IN & Leon Perkins, Shepherdsville, KY; Beloved Caregiver: Doris Thompson, Munfordville, KY. In addition to her parents and spouse, she was preceded in death by Four Sisters: Esther & Dorothy Perkins, Ruby Piotrowski, & Alma Hall; Brother: Lester Perkins; & a Son-In-Law: Robert Wayne "Doc" Dennison. Arrangements are being handled by Brooks Funeral Home, Munfordville, KY where the family will receive friends from 2:00 PM to 8:00 PM CT, Monday, June 11, 2012 and from 9:00 AM to time of service Tuesday, June 12, 2012. Funeral service will be at Brooks Funeral Home at 1:00 PM CT, Tuesday, June 12, 2012, with Bro. Curtis Slinker officiating. Interment will be at Munfordville Municipal Cemetery, Munfordville, KY.